is floral and herbaceous in the cup, and the tea has a rich body and mouth feel. Awesome bright and delicate tea! The leaf looks fresh and colour is vibrant. I highly recommend this tea. It has a bright green flavor. Will purchase again. Love, love, love this tea. It has become one of my favorite morning go to tea. This is a wonderful way to wake up. Very green and flavorful. I can get multiple infusions. This 2014 batch is the best crop in the 3 years I´ve ordered this variety from TeaSpring. It´s excellent: zero astringency. En Shi Yu Lu is the only China green tea that is processed using steam. The introduction of steaming adds depth of flavor and a fresh, vegetal quality to the tea. The flavor of En Shi Yu Lu is floral and vegetal in the cup, and the tea has a rich body and mouthfeel. En Shi Yu Lu is a delicious green tea from an area that does not produce very many green teas and certainly none as famous as this tea. I wish I could rate En Shi Yu Lu with 4 ½ stars because that´s what I feel would most accurately reflect my impressions. It suggests, but doesn´t ape, Japanese green teas and due to its similar production process, requires a bit more caution when brewing--err on the side of slightly cooler water and shorter steeps than for pan-fried green teas. It´s a lovely tea that yields very enjoyable results brewed either conventionally or overnight in the refrigerator (8 g/liter), with an unusual and pleasant lingering aftertaste. I wouldn´t rate it on the same level as a ming qian an ji bai cha or tai ping hou or other "great greens," but it´s darn close and, because of its non-mainstream method of production, should at least be sampled by anyone wanting to become knowledgeable of the many varieties of high-end Chinese green tea. Highly recommended. When I sniffed the smell of it from the bag just after the opening, it reminded me a smell of fresh milk, very interesting. After being brewed this tea delivered an amazing taste, refreshing aroma and a beautiful colour. I trully recomend. Very good tea. The leaf are long and narrow and for this it´s not so easy to measure-out the right quantity. En Shi Yu Lu This 2013 crop was satisfactory or in other words not to great or not too bad. Maybe it was the weather this year but have hopes for it being better next year. I have absolutely fallen in love with this tea. I drink it every day and am never without it. I never tasted this tea before, it was alright but nothing to warrant reordering it. Maybe since this is a new tea, I should experiment more with the brewing. This is one of the best teas I ever had. So fresh the scent and dense the flavor, marvellous aftertaste. I was very curious about this tea and I find it very good. Up to 2 infusion full of good taste. Beautiful green tea. I followed the brewing instructions and got 4 good infusions with my 150 ml tea pot of which the first 3 are just excellent. The 5th was already weak. Not bad for a green tea and using such a mall amount of tea makes this tea worth its money. En Shi Yu Lu green tea has a distinct taste and resembles Japanese tea. I personally do not enjoy the taste of Japanese green tea, but if I were to have to choose a Japanese tea, this might be the one. Отличный чай со сладковатым привкусом, очень качественный. The tea leaves are good quality. The taste is clean and a little sharp. Overall a good tea. Tea is the highest quality. Very sweet taste and aroma. This tea has become one of my favorites. The fragrance of this tea starts strong, with a beautiful lingering freshness. After infusion the freshness remains; with light bitter notes if infused to long. Good tea overall. It truly deserves the name of chinese gyokuro, it is a marvelous tea that most japanese teas would envy, it is like a temomicha at an affordable price, when brewed japanese style in a houhin 5 grams to 100 ml water at 70 C, for 1 minute, 20 s, 45 s, 1.20 s, 2 min +, it rivals the best shuppin grade sencha`s. The fragrance when you first open the packet will bowl you over: intensely floral sweetness with a slight grassy element and a very faint earthiness. The leaves are a deep, dark green and form very thin, long ´needles´ - once the water hits them they shine with a mutli-toned green luminescence - wonderful to behold! The liquor is itself rather more green than yellow in tint, unlike most green teas from the Middle Kingdom. Drinking the tea brings forth a complex set of flavours - floral and sweet with some grassiness, and more punch than one would expect. The taste lasts for quite some while after the pot/cup is finished. The finest green tea I have ever drunk. Bar none. Which meant I was initially somewhat reluctant to post any reviews for fear its short supply will diminish more rapidly. However, my desire to share pleasure has outweighed my selfishness. Pleasant, very mild, floral fragrance. The taste is very subtle-mainly vegetal and grassy. Patience and attentiveness will reward with the nuances in the brew. The leaves are beautifully processed, extremely thin, so be careful not to add too much because it inflates a lot. The bitterness only occurs if you let the first infusion steep too long. Overall, it is a very refreshing tea with a clean and smooth taste. Highly recommended! Absolutely wonderful and tasty tea. Very sweet and rich flavor. Excellent, high quality tea. Highly recommended. This was fat too subtle a flavour to enjoy. The smell of the brew promised much, but the taste was insipid even on the first wash and tasted like one wash too many. Experimented with different strengths and brew times. The brew always tasted too weak, though if brewed too long it then gave a bitter after taste. If you like a delicate flavoured tea this will be OK. I found a steamed Yu Lu in Tao of Tea in Portland many years ago and have been looking for another Yu Lu since. I don´t like the earthy taste but prefer a sweeter taste without the earthy after taste, This Yu Lu is an excellent tea, with a sweet after taste. I usually drink only Imperial Dragon Well (Imperial Garden - San Francisco - Roy Fong) and this is a excellent and less expensive substitute. ...for me the best way to start a day is drink a couple of cups of this wonderful tea. The dry leaf gave off a nice smell. This tea gave off a typical light bodied flavor, nothing too special; it was good, but not great. Second infusion was rather bland. A very interesting tea with a nice story. It is a perfect balance between Japanese technique and Chinese craftmanship in all ways. The leaves are reminiscent of gyokuro or sencha leaves, but are clearly processed with skillful Chinese hands. The aroma has both the vegetal Japanese smell and a foral smell that can only be found in Chinese tea. 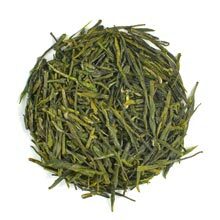 The taste also has a subtle vegetal taste like in gyokuro, with a sweet foral taste that is present in a good Chinese tea. A good tea, that is even better because of it´s story. This tea rox the history behind this tea makes drinking it even a greater pleasure. Wonderful tea; the sweet aroma of the dry leaf is a treat all by itself. This one will grow on you if you let it. very interesting green tea with evident similarities to sencha or gyokuro but with tea buds. very sweet tea, recommendable. This is an interesting tea. Pine needle type leaves and an ok brew. I can´t speak to its medical benefits, but its a pretty good tea.